Over the past three games, J.J. Barea is shooting 41.9 percent, has made 7 of 13 3-pointers and scored in double figures each time out. MINNEAPOLIS — Barely breaking verbal stride while answering a reporter’s question Wednesday after the Timberwolves’ victory over Portland, J.J. Barea was feeling a bit bolder than usual. The 5-foot-9 point guard’s locker sits next to that of 6-11 center Nikola Pekovic. As the two iced their feet down and chatted with the media, Barea reached into his lime-green plastic bin and shoveled some of its contents toward the big guy to his right. Pekovic, the largest man in Minnesota’s dressing room, responded with a shivering groan, then a hearty laugh. Such looseness from Barea — one of the Timberwolves’ most seasoned veterans, short stature aside — wasn’t present just a week ago. Three straight solid outings have alleviated the stresses of a three-week slump dating back to Nov. 20. There wasn’t much good-natured mischief during that span; only a frequently furrowed brow and a second-unit leader trying to figure out what was the matter. Barea feels his latest trip through the woods is over. "No question, I feel great," Barea said. "I know my roles a little bit better. I know what I’ve got to do when I come in, take my time, and if I make my outside shot, it helps me with everything else." In his past three games, the Puerto Rican backup point man is shooting 41.9 percent, has made 7 of 13 3-pointers and scored in double figures each time out. During the previous 11 outings before that, he shot 28.4 percent, made 7 of 29 3s and scored 10 points just once. Barea has navigated plenty of cold streaks during his seven-plus years in the NBA, enough to know they’re inevitable. The 2011 NBA champion put himself through some extra shooting sessions in the past week, hoping to regain the touch that ranks him as one of the Timberwolves’ top perimeter threats. Wednesday, he finally saw some results, nailing back-to-back 3s late in the third quarter of a 120-109 victory against the red-hot Blazers. They helped make amends for a missed triple late in Monday’s loss at Boston. "I’ve maybe worked out a little bit more, try to get a little more confidence in there before the game and stuff like that," Barea said. "I’m just gonna stay aggressive every game, night in and night out, and see what happens." That’s the book on Barea, who even during downturns can be found pushing the pace and either slashing to the rim or pulling back for a mid- or long-range jumper. When he hits, he’s happy. And so is a team whose bench has been mostly a liability so far this season. "We just need to keep getting our bench more and more involved," forward Kevin Love said. "Light that fire and push some energy into our entire lineup." Thanks to 10 points each night from Barea, Minnesota’s reserves outscored both Boston and Portland’s benches. They scored a season-high 45 points against the Celtics. Heading into Friday night’s clash with the Lakers, they remain the NBA’s third-lowest-scoring bench but have played with more cohesion and energy lately, coach Rick Adelman said. Alexey Shved has made a considerable difference, hitting shots that haven’t fallen for the majority of his second professional season. Dante Cunningham has been steady, too, along with newcomer Luc Richard Mbah a Moute. Rookie Gorgui Dieng already has proven his worth as a shot blocker. 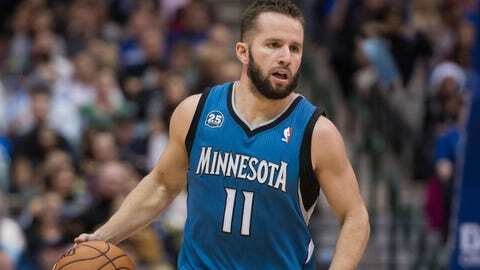 But Barea is the most proven point producer behind Minnesota’s first string, which is second in the league in scoring. He’s also the bench’s de facto captain and can frequently be seen making sure his fellow backups stay engaged during games. If he has turned a corner, there’s a good chance they have, too. "We’re playing good in the second group," Shved said. "J.J., Dante, everybody counts."